From 1 September 2016 until 13 January 2017, a total of 693 cases including 11 deaths of acute jaundice syndrome (AJS) have been reported from Am Timan, Chad, a country in the north of Africa, situated south of Libya and east of Sudan. 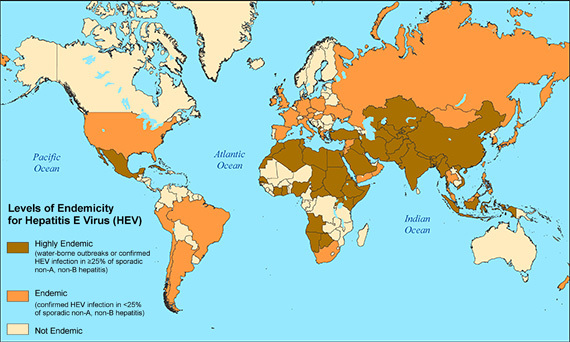 Of the 50 patients with AJS who were hospitalized, 48 were tested for Hepatitis E using the Hepatitis E Virus Rapid Diagnostic Test (HEV RDT) and 27 (56.3%) tested positive. In total, at the end of epidemiological week 2, 2017, a total of 126 tests have been performed, of them 57 (45.2%) were positive, while 69 (54.8%) tested negative for Hepatitis E. 18 (31.6%) of the 57 patients that tested positive using the HEV RDT also had a positive malaria test, and 20 (29%) out of 69 patients that tested negative using the HEV RDT also had a positive malaria test. Since September 2016, 11 deaths have been reported among the hospitalized cases but the total case fatality might be underestimated. As of 13 January 2017, 16 pregnant women presenting with AJS have been hospitalized and tested for Hepatitis E, 12 (75%) of them tested positive using the HEV RDT. Of the pregnant women presenting with AJS, four have reportedly died (three had tested positive for Hepatitis E). Approximately 90% of the AJS cases were reported from Am Timan which appears to be the epi-centre of the ongoing outbreak, and most of the cases are identified through active case findings. As of 13 January 2017, AJS cases have been reported from 59 different quartiers in and surrounding Am Timan.